This has nothing to do with Duke Nukem Forever the game, but it's still a sad tale as far as game advertising goes. While some titles have caught flak in recent years for appearing on things like buses, we've never seen one turn up in such an inappropriate place. 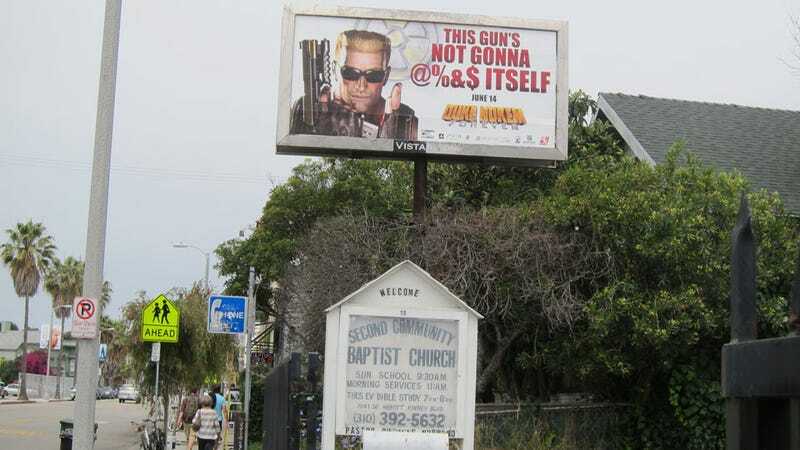 This billboard, advertising the decidedly-adult DNF and complete with censored cursing, appeared right next door to a Baptist Church in Venice, Los Angeles. Worse still, out of shot but directly across the street is Westminster Elementary School, which only runs from kindergarten to the fifth grade. Thankfully, after City Councilman Bill Rosendahl contacted the billboard's operator Lamar Advertising and let them know he'd received complaints, it was taken down.